Experience Citizen Science with the INTCATCH Boats! Come and experience measuring water quality as a citizen scientist with Thames21 and the INTCATCH boats on World Water Day. 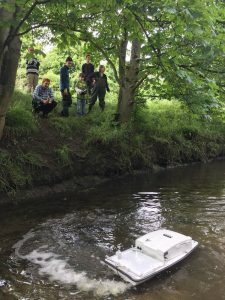 See these boats in action and have a go with them yourself, all while understanding more about water quality in your local river! There will also be opportunities to remove plastic pollution from this stretch of the river and witness some riverfly monitoring as well during the day. All tools and equipment are provided and we will also be providing refreshments including tea and biscuits. Please wear appropriate clothing for the weather conditions, with wellies if possible! Children under 16 are very welcome but will need to be accompanied by an adult. Meet by the Fray’s River along Rockingham Parade for the start of the event at 11:30am. We will be there until 2:30pm – so feel free to show up at any time. This event is kindly funded by the Heathrow Community Fund.